The rotating shallow water (RSW) model is of wide use as a conceptual tool in geophysical fluid dynamics (GFD), because, in spite of its simplicity, it contains all essential ingredients of atmosphere and ocean dynamics at the synoptic scale, especially in its two- (or multi-) layer version. 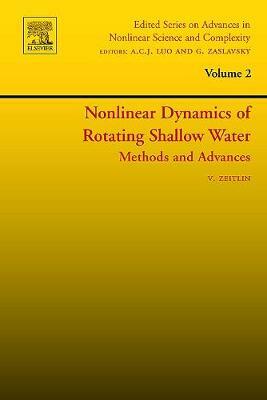 The book describes recent advances in understanding (in the framework of RSW and related models) of some fundamental GFD problems, such as existence of the slow manifold, dynamical splitting of fast (inertia-gravity waves) and slow (vortices, Rossby waves) motions, nonlinear geostrophic adjustment and wave emission, the role of essentially nonlinear wave phenomena. The specificity of the book is that analytical, numerical, and experimental approaches are presented together and complement each other. Special attention is paid on explaining the methodology, e.g. multiple time-scale asymptotic expansions, averaging and removal of resonances, in what concerns theory, high-resolution finite-volume schemes, in what concerns numerical simulations, and turntable experiments with stratified fluids, in what concerns laboratory simulations. A general introduction into GFD is given at the beginning to introduce the problematics for non-specialists. At the same time, recent new results on nonlinear geostrophic adjustment, nonlinear waves, and equatorial dynamics, including some exact results on the existence of the slow manifold, wave breaking, and nonlinear wave solutions are presented for the first time in a systematic manner.